pH, or potential Hydrogren, is one of the most important parts of maintaining a healthy plant in a hydroponic garden. The pH level of the water in your hydroponic system directly effects how well your plants grow. An incorrect pH level will reduce or completely lock out the amount of nutrients a plant can absorb. It could even kill your plants! When it comes down to it, pH is the measure of the acid / alkaline balance of the water in your hydroponic system, also known as the nutrient solution. The pH level is measured on a scale of 0 to 14, with 0 being acidic and 14 being alkaline. A pH of 7 is neutral and most plants prefer a neutral pH, although some plants do better within a certain pH range. To put it simply, you need a balanced pH in order for your plants to thrive. This guide will cover the basics of pH, how to check your pH, and how to adjust the pH in your hydroponic garden. A balanced pH level is critical to the healthy growth of a plant. Without a balanced pH, the plant can not absorb nutrients essential to growth. In general, most plants prefer a pH between 5.0 and 7.5. This chart will show you the availability of nutrients at different pH levels. Checking the pH of your hydroponic system is a relatively straight forward process. There are three main methods used for checking the pH of your nutrient solution. I will cover all three in this guide. The cheapest method involves paper test strips. The strips are covered in a pH sensitive dye that will chance color when dipped in a nutrient solution. You then compare the strip to a color chart to determine the pH. While inexpensive, this method isn’t very accurate and it can be made more difficult if you have a nutrient solution that isn’t clear. The color of your nutrient solution may vary depending on the type of nutrients you’re using. A liquid based pH test kit is another popular option. This is one of the most popular methods, as it is a bit more accurate than the paper test strip method. To use a liquid test kit, simply add a few drops of pH sensitive dye to a small vial with containing your nutrient solution. The color of the nutrient solution will change, which you will then compare to a color chart to determine the pH level. Like the test strip method, I don’t recommend using the liquid method if the color of your nutrient solution has changed because of your nutrients. The most effective way to check your pH is with a digital pH meter. Digital meters come in numerous sizes and price ranges depending on the features included. A digital pH pen is a commonly used pH reading tool for the hobby gardener. They are extremely easy to use - Simply insert the electrode tip of the meter into the nutrient solution until a pH reading is displayed on the screen. It is important to keep your electronic pH meter properly calibrated. This is the most important thing to remember if you own an electric meter. Some meters require the glass electrode to be kept wet at all times, so some meters will come with a storage solution that you rest the tip of the meter in when not in use. This type of meter also needs to be calibrated often, which is simple to do. You will need a calibration solution in order to calibrate your meter. Calibration directions vary from brand to brand, but generally you just insert the top of the meter into the calibration solution and adjust the calibration setting on the meter until the reading on the display matches the pH of the calibration solution. We highly recommend keeping an extra pH meter on hand, as they have a tendency to break down without warning. Given how important your pH is, you don’t want to be caught without the ability to check your pH. Adjusting the pH of your nutrient solution is very easy to do. You will need a pH up and pH down solution. 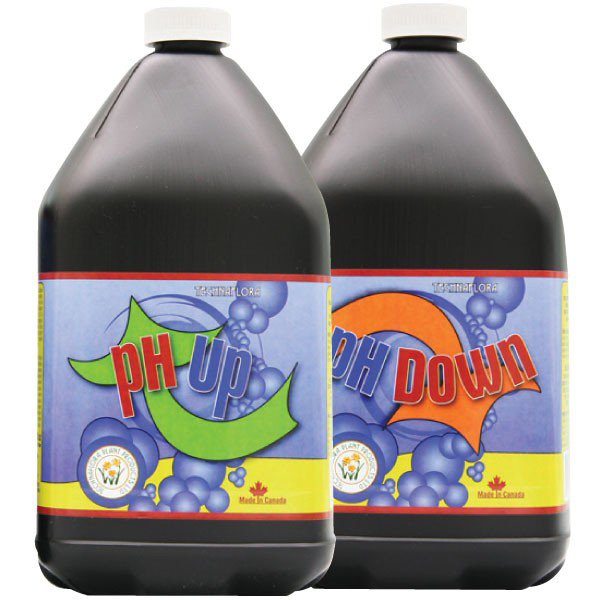 If you need to raise or lower your pH, then add some pH up or down to your nutrient solution. Allow the adjustment solution to properly diffuse and circulate throughout your system before re-measuring the pH of your nutrient solution. We recommend checking the pH of your nutrient solution once a day, although you may be able to check it less often depending on some factors. The pH in each system will fluctuate, some more quickly than others. Factors such as your water source, grow medium, and nutrients can effect the rate at which your pH fluctuates.